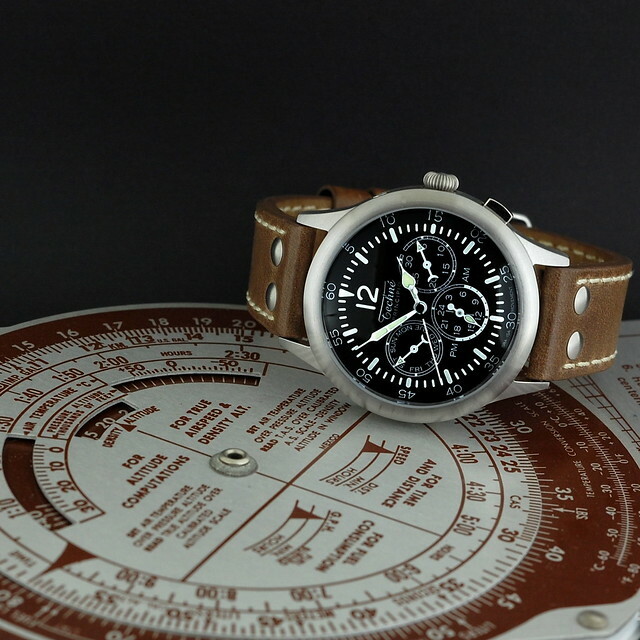 http://rkthb.co/53303 After successfully crowfunding a diving watch in 2011 and a chronograph in 2014, the team of VANTGARD is opening pre-orders on a Dual-Time Swiss Concept Aviator Watch. The timepiece was designed to combine great looks with a Swiss-engineered mechanism at an affordable price. Funders can choose between 3 different straps, and each watch will be delivered in a nice military-style kraft box and will be covered by a 24 months Limited Warranty. Sized at 39.5 mm (15½”), the case is forged in 316L surgical steel and receives a brushed finishing. Its diameter is perfect for men and not too big for women. Designed for water-resistance to 5 bar (static depth of 50 metre), it uses a hardened mineral crystal with a domed shape, reminiscent of the acrylic crystals of early 20th century military watches. All components of the quartz mechanism are engineered and produced in Switzerland by ISASWISS PLC before assembly in Asian Swiss-grade factories. The development process spans over 12 months, and VANTGARD chose to work through the first 10 months before launching the crowdfunding, which only leaves 2 months before planned mass production. Design has been finalised, blueprints submitted by suppliers have been approved and production moulds developed. Leaning on the experience of their last RocketHub project, VANTGARD planned ahead of time to avoid any unexpected delays, so they are confident that they will meet the deadline. An updated timeline of this project is made available on Tiki-Toki.com. If the funding is successful, mass production will be launched on the 1st or April 2015, and items will start shipping to funders by the 15th of April.